Over the years the word Bismarck is one I had heard often, but if push came to shove, I could only hazard a guess that it had something to do with a naval ship, but other than that, I’d be guessing wildly what it really meant to the history books. 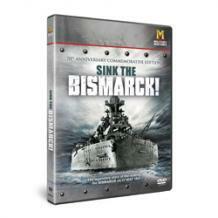 It’s like one of those ingrained historical ideas you should know, but just don’t, so when a DVD came up on my review list about it, which also proved my basic knowledge that it was a ship, made me think it was time to learn me some about this word, Bismarck. Without historical context, this show could very easily be seen as just another war story, but by the end of the DVD, I saw why it was such a big deal in the history of warfare, both the ship itself and its sinking. So though this show won’t be for everyone, it’ll be a must have for navel and warfare buffs, or anyone with a keen mind for history.